SonneEnergie™ Solar Hot Water System is the embodiment of Harmony coexistent between Aethestic and Performance. SonneEnergie™ Energy Efficient Heat Pump systems for hot water heating and enjoy 75% savings. Generate electricity using Solar Energy using on-grid or off-grid systems. High efficiency DC/AC inverters for solar photovoltaic use with MPPT technology. 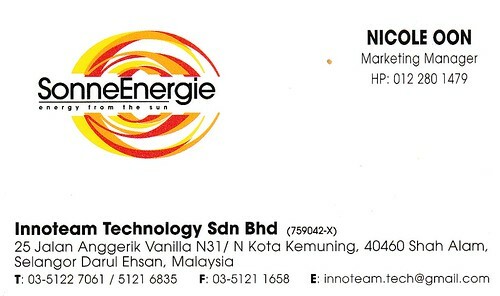 Innoteam Technology Sdn Bhd was founded in 2007 as a division of Innoteam Group that mainly dealt with Green technologies. The founding of the company is a natural progression of the close links we have developed with China Aerospace Science and Industry Corp (Institute 207 of China Aerospace). We specialized in designing and commissioning eco-friendly and energy saving products. Innoteam Technology provides a full range of green energy solutions for restaurant and hospitality industries. For these products, we also professional provide technical assistances in maintenance. We have a wide range of catalogue for every category of business — from mainstream to high-end — and at a very affordable price. Our systems are highly efficient and reliable. We know that these two aspects are vital in running a business, especially in hospitality industries. Who would like inconsistent hot water output or dark and insufficient lighted corridors? We have strict quality control policy so our product were made sure of the highest quality. These quality control policy are in compliance and certified internationally by TUV, CE and RoHS. We send our engineers to the site to survey thoroughly so we can design a system specifically for your premise. Once our systems are installed, you can enjoy premium personal assistance from our technical staff if there are any issues. We work closely with all of our clients to identify issues and solve them so we can improve constantly. We ensure that all of our clients are happy with the finished work and 100% satisfied with our products. Always strive towards achieving a better understanding on each of our clients unique needs. Always work closely with each of our clients in order to personalize the most suitable eco-design for them. SonneEnergie is willing to go extra miles in serving our clients better. We envision a future where everyone can coexist in harmony with the Nature; receiving Nature’s blessing without harming it in return. We hope to grow with our clients in becoming one of the largest and most aggresive corporation when it comes to popularizing the Green norms. We tailor made our packages to suit each of our clients, ensuring the shortest Return of Investment and highest Saving for our clients. We have several plans in motion that will enable us to leapfrog our own existing abilities in serving our clients better. As of 2012, our group had formed offices in Malaysia, Indonesia, Thailand and China. These offices are fully furnished with all necessary facilities, design teams, technicians and aftersales service teams. Besides boosting our capability to capture new markets in Asia, these moves have efficiently extended our aftersales and installation coverage. We have a team of qualified and well trained technicians to attend design, installation, troubleshooting, and aftersales services in these regions. In 2012, we have been appointed by Samil Power Co. Ltd, a worldwide recognized solar photovoltaic inverters provider, to become their main agent in South East Asia. Samil Power Co. Ltd has more than 10 branches worldwide with main offices located at Sydney, Munich, Beijing, Shenzhen, Wuxi and Suqian. This move further completes our coverage in green technology as we now not only able to provide solar and air-source heat pump combined water heating system but also are capable of supplying solar photovoltaic electricity producing system to commercial sized premises. Last but not least, we at Innoteam Technology would like to express our appreciation to you for willing to spend your precious time in knowing about us. With this, we would like to invite you to join us in greening the world and start enjoying tremendous saving now! !